Absolutely shocked and devastated to read the news this morning that Jack Layton has died at the age of 61. When I lived in Toronto, I was a card-carrying member of the NDP (a political party founded by a Scot, and Grandfather of Keifer Sutherland, Tommy Douglas.) 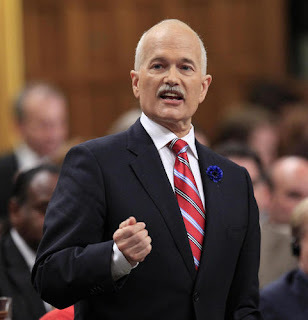 Jack Layton, a fellow cycling enthusiast is what Canada is all about: progressive, honest, and positive. I wasn't NDP, but I must say he was a great leader! Passionate and very likeable. Very sad news indeed. I got a little weepy at work today reading his letter, especially his final paragraph.